Atoz on Suspense - Remember Me? In "The Red-Headed Woman," Lucille Ball plays a dangerous woman on the run, and Desi Arnaz plays the man... who gets in her way. Linda is a secretary for the Jenson Company in Kansas City. One day, she gets a call from her fiance, Frank, telling her that he has met someone else. For two years, her life had revolved around him, but now, she decides to live for herself. Linda wants to get away, and for that she needs money, so she steals a gun from her boss and the payroll money from the company safe. LInda hits the road and drives west towards Texas. On the car radio, there is a news report about a Texas bank robbery and the two dangerous criminals that are now on the loose. Not long afterwards, she meets a man stranded on the side of the road. He asks her for a ride, but she hesitates because he matches the description of one of the robbers. Is he the man the police are looking for? If so, where is his red-headed accomplice? "The Red-Headed Woman" was written by Nancy J. Cleveland, produced by William Spier, and directed by Norman MacDonnell. Paul Frees was the announcer. This was the first of two appearances that Lucille Ball and Desi Arnaz made together on Suspense. 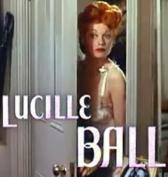 (Lucille Ball made four other appearances on Suspense on her own.) At the time this episode aired on November 17, 1949, Lucille Ball was still appearing on the CBS radio show My Favorite Husband. The television show I Love Lucy began in October of 1951. Adding to our collection of old time radio shows about the dangers of ventriloquist's dummies, here is an episode of Blackstone, The Magic Detective called "The Educated Dummy." In this story, Blackstone and his assistant, Rhoda, are playing a charity benefit. Rhoda loves their dressing room, but she isn't impressed by the ventriloquist act that goes on before them. In her opinion, the act is "pure corn." Rhoda is right, but that corny ventriloquist just may have a better trick up his sleeve than Blackstone. This twelve minute mystery aired on Halloween in 1948, but it isn't scary. Ed Jerome played Blackstone and Fran Carlon played Rhoda. This episode aired on October 31, 1948. Suspense's "Riabouchinska" is introduced with some narration. It continues with more and still more narration. There is too much narration. "Riabouchinska" is the story of a ventriloquist, the woman that he once loved, and the ventriloquist's dummy that he created in her image. There is also his wife, her boyfriend, and a blackmailer. Wally Maher plays the police detective who investigates the murder of the blackmailer. Joseph Kearns stars as John Fabian the ventriloquist and Lurene Tuttle stars as the high-pitched voice of Riabouchinska, the ventriloquist's dummy. The version of this story done for television by Alfred Hitchcock Presents is the better version of the two. Claude Rains plays the tragic and deluded John Fabian, and a young Charles Bronson plays the detective who uncovers the sad truth between Fabian and his puppet. Both episodes were based on the short story "And so Died Riabouchinska" by Ray Bradbury. Suspense's radio-play and the tele-play for Alfred Hitchcock Presents were both written by Mel Dinelli. The narrator is Armana Fargey, a pseudonym for actress June Havoc. This episode aired on November 13, 1947. A different version of "Riabouchinska" appeared on television in 1988, for an episode of Ray Bradbury Theater. Molle Mystery Theater's "The Rival Dummy" is, in their words, "a macabre adventure into the strange workings of an unbalanced mind." "The Rival Dummy" begins with a murder, and then goes back to explain just what did, or didn't, happen. The drama centers on the tense relationship between the ventriloquist Gabbo the Great and his dummy, Jimmy. There is also Rubina, a second-rate performer, who makes the mistake of getting involved with this act. Gabbo is in love with her, but Jimmy is fed up with the no-talent bimbo that has joined them. When Gabbo smacks Jimmy for bad-mouthing Rubina, things get worse. Their manager wants Gabbo to see a psychiatrist, but it is already too late to save their doomed act. This 1946 radio-play starring Walter Slezak and the 1929 movie The Great Gabbo starring Erich Von Stroheim were both based on the 1928 short story "The Rival Dummy" by Ben Hecht. The movie was not a horror story, although it is often marketed as one. Molle Mystery Theater's version is a murder mystery with a pinch of horror thrown in at the end. The sound quality of this recording isn't perfect but it isn't so bad as to be distracting. "The Rival Dummy" was also adapted for television and performed on the television show Studio One in 1949. Sixty years ago Escape broadcast its first episode,"Dead of Night," on March 21, 1947. A month earlier the story had been broadcast on the CBS series Out of this World with the same actors in the lead roles. When listening to Escape's original opening sequence, you will notice a similarity to the opening words of The Twilight Zone which came along about a decade later, also on CBS. Escape's premier episode was based on one of the stories from the classic British horror film Dead of Night (1945). The movie is a collection of supernatural tales, including the urban legend of "The Phantom Coachman." 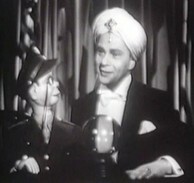 Its most famous segment is about a ventriloquist named Maxwell Frere, played by Michael Redgrave, and Hugo, his dummy (pictured left). Dead of Night was also one of the inspirations for the famous Twilight Zone episode "The Dummy" in 1962. Richard Attenborough's 1978 film Magic also borrowed a little from this story. Escape's "Dead of Night" stars Barry Kroeger as the ventriloquist and Art Carney as the dummy. The radio versions of this story aren't as good as the movie! The ventriloquist/comedy act of Edgar Bergen and Charlie McCarthy was a huge success during the "Golden Age of Radio" but ventriloquists and their dummies also made excellent fodder for radio thrillers and horror shows. The ventriloquists portrayed in these shows were often down on their luck, tortured souls working in seedy places -- a stark contrast to the perennially sunny Bergen & McCarthy Show. The Suspense episode "Flesh Peddler" follows a typical "haunted" ventriloquist plot but it remains interesting because of the casting. This is an old radio show with two performers who are familiar to any Gen-Xer. It stars Deforest Kelly, whom we all know as Dr. McCoy on Star Trek, but it also has Daws Butler, who was the voice of Yogi Bear, Huckleberry Hound, Elroy Jetson and numerous other cartoon characters. Anyone who watched cartoons in the 1970's will recognize his voice. Deforest Kelly plays a booking agent who takes an interest in a ventriloquist act he finds at a carnival. Daws Butler provides the voice of Arthur, the slow-witted knife-thrower. It is unfortunate that they did not choose Butler to play the ventriloquist, given his enormous talent for providing character voices, but this was before he became famous for his work in cartoons. This show was broadcast on August 4, 1957. Are you looking for "Three Skeleton Key"? Escape - Episode Logs, Plot Summaries, Etc. Suspense -- Episode Logs, Reference Material, etc. News from Escape and Suspense!